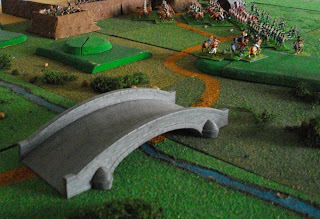 Grand Battery comprises a guide to Napoleonic wargaming and a set of rules. A full review of the book is provide elsewhere on this blog (review of Grand Battery). The rules are an interesting mix of ideas and mechanisms that are similar to aspects of other rule-sets. Familiar mechanisms include card-based turns for movement (like Piquet), tests of the resolve of defenders and of attackers (common to many wargames rules of 1970s and 1980s, including Bruce Quarrie's), use of a number of combat dice (like Piquet & Blackpowder), command impact on responsiveness (similar to many boardgames, Empire & Napoleon's Battles), and quality of command affecting initiative (like Empire). That said, the mechanisms and ideas have been combined into a genuinely novel set of rules. Grand Battery uses the random drawing of cards for each brigade commander and higher plus specific orders to try to overcome the wargamer’s helicopter view of the battlefield. Their implementation of cards is preferable to that used in rules such as Piquet and Le Feu Sacre. We chose the Battle of the River Côa (often called action at the River Côa) as the scenario to play-test the Grand Battery rules. 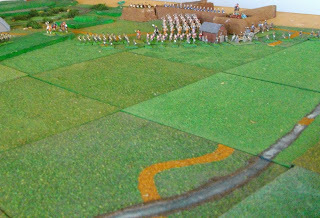 This is an interesting scenario with a small body of elite troops (the British Light Division) against a larger number of good quality line troops (two divisions from Ney’s VI Corps plus accompanying cavalry). The battle is fought over challenging and ‘interesting’ terrain. A variety of troop types are involved with light and line infantry, light cavalry and dragoons, skirmishing cavalry and infantry piquets, horse and foot artillery and a Portuguese heavy artillery battery in Almeida. The battlefield is a combination of open and rough terrain, with defensible slopes and a river crossing. The eastern ‘half’ of the battlefield comprises a fairly open plain which extends from the village of Vale da Mula to the walls of the fortress town of Almeida (Photo 1). The plain is traversed by the small, easily fordable Alvercas stream. By contrast the western end of the battlefield features the River Côa which is passable only by the stone bridge and is surrounded by steep, rocky river banks on either side (Photo 2). A description of our scenario for this battle can be found at River Côa scenario. The first problem we noticed with Grand Battery was that they do not seem quite sure at what scale they want to operate. The authors suggest that units are regiments, but no system is proposed to, for example, account for a single battalion British regiment against a three-battalion French one. The orders of battle seem to indicate a flexible system whereby a unit may be a battalion or a regiment depending on the size of the game. As the River Cóa is a small battle, we chose to have units as battalions. The next problem was the ground scale. Once again, no scale is given, but we assumed a nominal scale of around 1 mm to 1 metre as indicated by the movement rates and frontages of units. As mentioned above, the rules use a simple and realistic system to reflect command and control, based around the historical command structure. Allowable orders to lower levels of command (e.g. brigades and units) are dictated by the orders given further up the command hierarchy. This approach was first used in the Empire rules however, unlike Empire’s percentage chance to change orders based on command quality, Grand Battery uses a command radius and leadership factors to determine whether a formation is in command. These factors vary with the quality of a commander. The entire system is simple and effective and is reminiscent of many board-games. The heart of the rules are a series of tables that are used to determine firing, determination to charge or to receive a charge, results of mêlée and morale. At first these appear complex, but they are simple and effective. Ratings of the experience and training of units serve as the basis of most of these tables and are the sole factor in the attacker’s resolve to charge and defender’s resolve to a receive a charge.It was our first use of these tables that indicated that these rules were unlikely to be for us. The first turn produced some “interesting” developments. The French 3rd hussars tried to charge the British cavalry piquets around Vale da Mula (Photo 3). They duly took the attacker’s resolve test. A nine was rolled on the die resulting in an immediate rout. Clearly those British skirmishing cavalry were scary! The detachment of British rifleman in Vale da Mula then fired on the French 15th chasseurs à cheval and destroyed two bases. Not to be outdone, the chasseurs à cheval fired at the piquets of the 16th light dragoons and eliminated them. This fire was clearly devastating stuff, even when from horseback. These astonishing results continued in turn two. A regiment of French dragoons (15th) charged the KGL hussar piquets, pushing them back but losing two stands in the process! Another three stands were removed due to firing from the 95th posted in the village (a single stand only) and from the KGL hussars. More amazing still, especially after the result with the 3rd hussars in turn one, was that the dragoons passed their morale. Ferey's infantry brigade moved up to Vale da Mula, fired on the 95th and destroyed them. The devastation wreaked by the piquets was not over. In turn three the KGL hussars fired on and destroyed the remainder of the 15th dragoons. Satisfied that the piquets would soon be eliminated, the French moved up past Vale da Mula on turn four. Determined to clear the village Lamotte’s horse battery fired at the 95th in Vale da Mula, inflicting some casualties, but with no further effect. Gardanne’s remaining regiment of dragoons moved towards the Alvercas stream only to be shaken by artillery fire from Ross’ troop of RHA. At the southern end of the French line, Simon’s foot battery was shaken by long-range fire from the Portuguese heavy battery in Almeida and retired. This was just the beginning. In turn five the heavy gun again fired at long range, this time inflicting two stands of loss on the French 15th chasseurs. They the passed morale test. The French retaliated and Gardanne’s horse gun fired at Ross’ horse battery at long range destroying a gun and 1 crew. Not to be outdone, Ferey's foot battery fired at and destroyed the remaining KGL hussars around Vale da Mula. The tremendous casualties from firing continued in turn six. The Portuguese heavy gun fired at long range and inflicted two further stands of losses on the French 15th chasseurs, destroying the unit. Anson’s KGL hussars standing in line around the mill were mauled by fire from Gardanne’s horse guns as were the French 25th dragoons when fired upon by the main body of the 95th rifles that were posted in front of the mill. Turn seven saw more casualties from firing before we gave up. This artillery fire was reminiscent of Quarrie’s "machine guns", but on steroids! So ended our dalliance into the world of Grand Battery. As Julian said, they are somewhere between Warhammer 40K and a real set of rules! While they are easy to use, with a mechanism that is quick to understand and even to predict results, any relationship between these rules and a Napoleonic battlefield are purely coincidental. 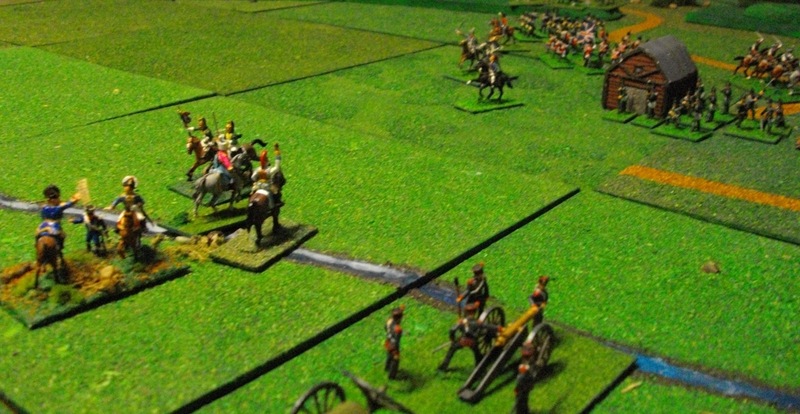 We concluded that the rules may work in a multi-player game with an umpire to adjudicate any ‘ridiculous’ results, like our charging French hussars, but as a stand-alone set they leave a lot to be desired. The experience was not a complete waste of time. 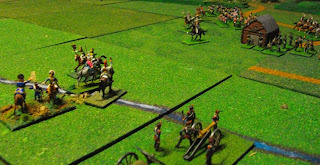 While not a Napoleonic wargame we did have a lot of laughs; mainly at the expense of the rules. In addition, we will be considering including two aspects in our preferred rules as a result of this test of Grand Battery. The first is an optional rule for firing by cavalry. The second is to utilise a system like the one in Grand Battery for valuing objectives differently for the two sides and using these values in the determination of victory. 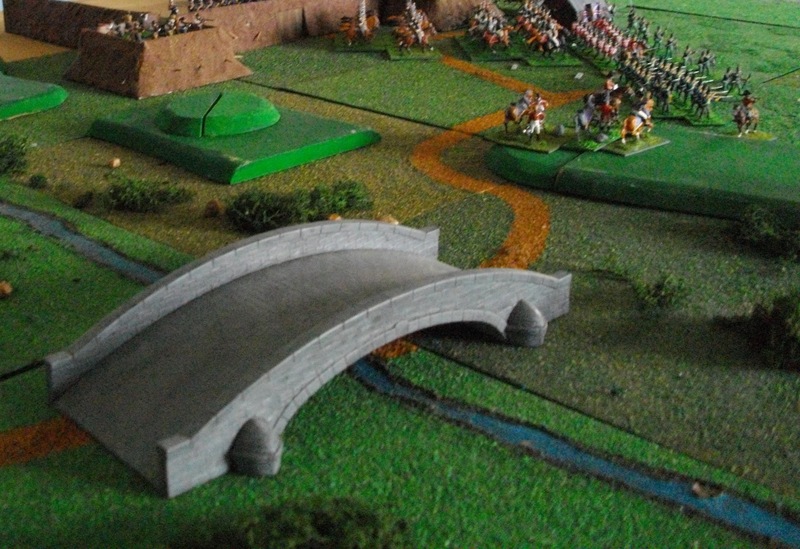 We are now looking forward to replaying the battle of River Côa with a proper set of rules.